491 Beacon (21-23 Massachusetts) is located on the SW corner of Beacon and Massachusetts Avenue, with 483 Beacon to the east, across Mass. Ave., 495-497 Beacon to the west, 7-9 Massachusetts/504 Beacon to the north, across Beacon, and 25-27 Massachusetts to the south. 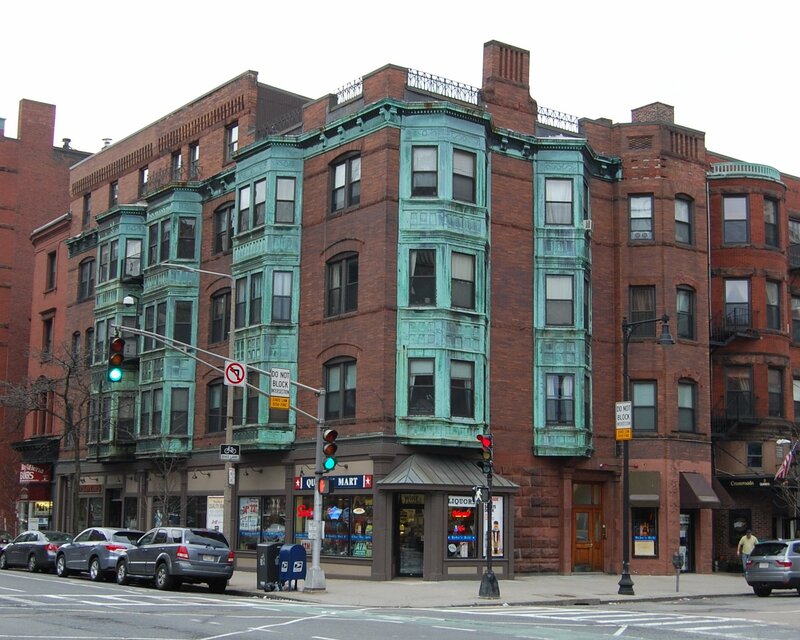 491 Beacon (21-23 Massachusetts Avenue) was designed by architect Ernest N. Boyden and built in 1891 by John Hurley, builder, as a three-family building and store. It was built for real estate dealer Seth Russell Baker, one of three contiguous multi-unit buildings built for him at the southwest corner of Beacon and Massachusetts Avenue: 25-27 Massachusetts Avenue, 491 Beacon (21-23 Massachusetts Avenue), and 495-497 Beacon. Seth Baker is shown as the owner of 491 Beacon on the original building permit application for 491 Beacon, dated February 28, 1891. 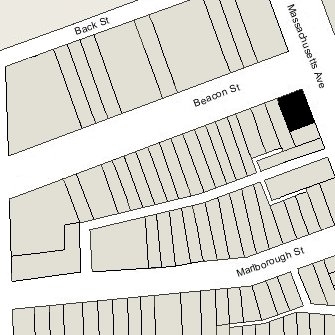 On the application, the address is shown as 491-495 Beacon, corner 470 West Chester Park (West Chester Park was renamed Massachusetts Avenue on March 1, 1894). Click here for an index to the deeds for 491 Beacon (21-23 Massachusetts Avenue), and click here for further information on the land west of Massachusetts Avenue between the south side of Beacon and the north side of Commonwealth. On October 1, 1891, 491 Beacon was purchased from Seth Baker by Eugene Hamilton Fay, an associate of real estate dealer Henry W. Savage, who was the leasing agent for the buildings built by Seth Baker at 479-481-483 Beacon. On October 31, 1891, 491 Beacon was purchased from Eugene Fay by retail clothing merchant and banker Abraham Shuman. He and his wife, Hettie (Lang) Shuman, lived at 60 Vernon in Roxbury. After her death in June of 1904, he moved to 90 Commonwealth. 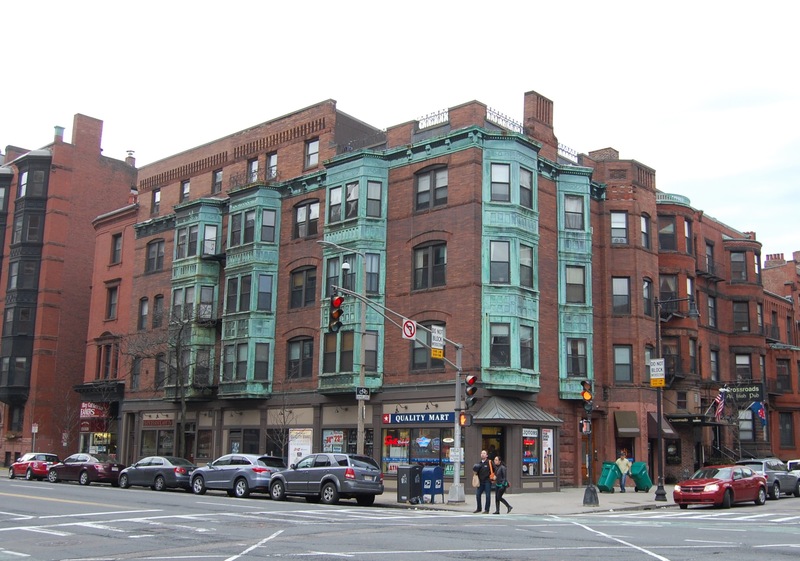 By 1897, an additional (fifth) story had been added to the 23 Massachusetts Avenue portion of the building and to 25-27 Massachusetts Avenue. Abraham Shuman died in June of 1918. 491 Beacon continued to be owned by his estate. On March 31, 1923, 491 Beacon was acquired from Abraham Shuman’s estate by Carroll T. Donohue, who conveyed it on April 2, 1923, to real estate dealer Ira W. Shapira, as trustee of the Inverness Realty Trust. In about 1924, the storefront at 23 Massachusetts Avenue became The Esplanade Restaurant. It was owned by the Caracostas family, who were confectioners doing business as Caracostas Brothers. The partners were Angelo (Evangelos) E. Caracostas, John (Johannes) E. Caracostas, James (Dimitrios) E. Caracostas, and Peter (Panagiotis) E. Caracostas, all children of Efstradios and Irene (Erini) (Kuses) Caracostas. The Caracostas family also operated a restaurant, the Chimes Spa, at 328 Massachusetts Avenue (corner of Huntington), and in August of 1926, the Chimes Spa Company purchased 25-27 Massachusetts Avenue, after which they expanded The Esplanade Restaurant (later the Esplanade Café) into 25 Massachusetts Avenue. It remained at 23-25 Massachusetts Avenue until about 1949, when the Esplanade Café terminated its lease at 23 Massachusetts Avenue and expanded into 495-497 Beacon, which it purchased in June of 1949. On February 26, 1925, 491 Beacon was acquired by Bertha (Levitt/Leavitt) Miller, the wife of Max Samuel Miller. 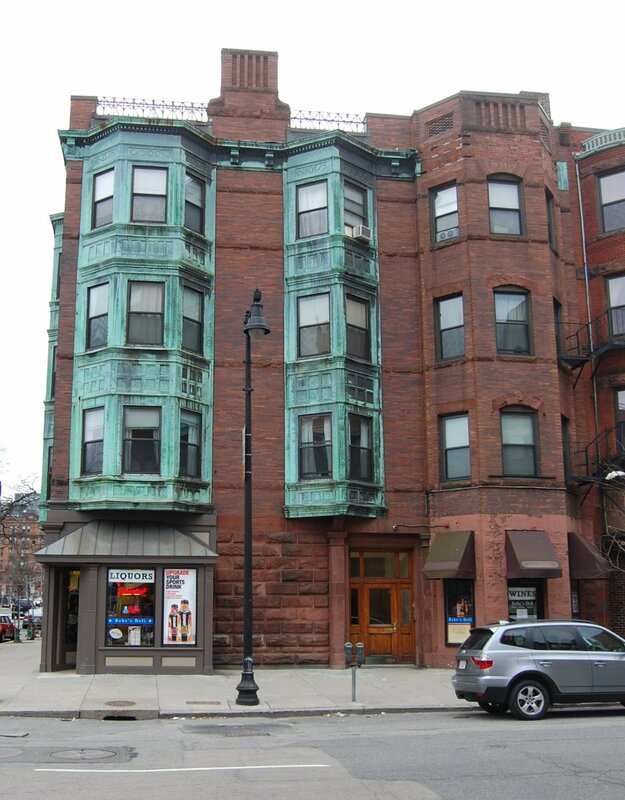 He was a druggist, doing business as the Miller Drug Company, and maintained a retail store in the building at 21-23 Massachusetts Avenue, at the Beacon Street corner. The Millers lived in one of the apartments at 491 Beacon; they previously had lived in Cambridge. Max Miller died in September of 1964. Bertha Miller continued to live at 491 Beacon in apartment 1. The Miller Drug Company continued to operate at 21-23 Massachusetts Avenue, managed by the Millers’ son, Eugene M. Miller. He and his wife, Susan (Lement) Miller, lived in apartment 2 at 491 Beacon. In March of 1967, Bertha Miller acquired 25-27 Massachusetts Avenue from Edward J. Goodfellow. He also owned 495-497 Beacon, which he continued to own. In August of 1982, he applied for (and subsequently received) permission to legalize the occupancy of 491 Beacon as seven apartments, a retail store, and a restaurant. 491 Beacon remained a residential and commercial building in 2018.